Very spacious rooms with very nice kitchen. We loved our stay here. Kids were able to run around in the room and they loved that too. The location of this property was perfect for our family. Thank you for the memories. Where to find Kona Coast hotels near an airport? 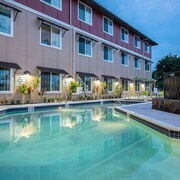 How can I find hotels in different Kona Coast neighborhoods? 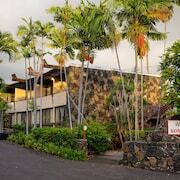 Where can I find hotels in Kona Coast that are near tourist attractions? Planning to organize some time in Hawaii? 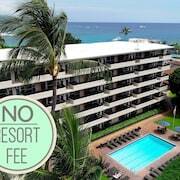 Hoping to reserve somewhere to stay in or near Kona Coast? Within 6 miles (10 kilometers) of the city center you can find 2 Expedia-listed hotels and apartments. There are a number of Expedia-listed hotels within a 6 miles (10 kilometers) radius, like the Four Seasons Resort Hualalai at Historic Ka'upulehu and Mango Sunset Bed and Breakfast Inn at Lyman Kona Coffee Farm. The Lava Lava Beach Club is situated 10 miles (16 kilometers) from downtown Kona Coast. 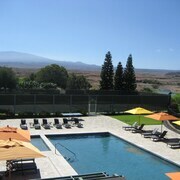 Or, alternatively, the Islands at Mauna Lani can be found 11 miles (18 kilometers) away. The Mauna Kea Beach Hotel, Autograph Collection and the Kohala Suites by Hilton Grand Vacations are other alternative places to book accommodation around Kona Coast. Looking for things to do? Spend a few hours discovering Mauka Meadows Coffee Farm, Holualoa Gallery and UCC Hawaii Kona Coffee Estate, in Holualoa, 11 miles (18 kilometers) to the north of Kona Coast. 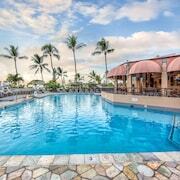 Expedia-listed Holualoa hotels are the Kona Coast Resort and Castle Kona Bali Kai , a Condominium Resort. 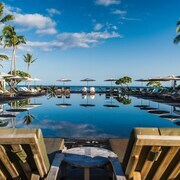 Alternatively, you could stay in Waikoloa, 12 miles (19 kilometers) to the southwest of Kona Coast, where you can choose from the Fairmont Orchid, Hawaii and Mauna Lani Bay Hotel and Bungalows. The Waikola Village Golf Club, Waikoloa Kings Golf Course and Genesis Gallery are some of the most popular points of interest to explore when visiting Waikoloa. Kailua-Kona is home to some 12,000 people, and can be found 6 miles (10 kilometers) northeast of Kona Coast. A few local attractions include the Makalei Golf Club, Mountain Thunder Coffee Plantation and Hula Daddy Kona Coffee Plantation There are some great Expedia-listed accommodations in Kailua-Kona that will suit most tastes and budgets. 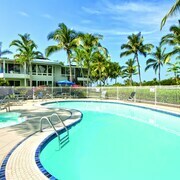 Popular options include: the Wyndham Royal Sea Cliff, Aston Kona by the Sea and Wyndham Kona Hawaiian Resort. Two more accommodation choices include: the Royal Sea Cliff Kona by Outrigger and Courtyard by Marriott King Kamehameha's Kona Beach Hotel. Our destination page is also a great way to learn more about Kona Coast. 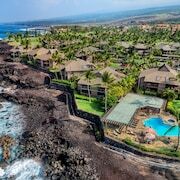 What are the most popular Kona Coast hotels? Are there hotels in other cities near Kona Coast? 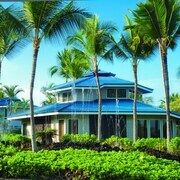 What other types of accommodations are available in Kona Coast? Explore Kona Coast with Expedia.ca’s Travel Guides to find the best flights, cars, holiday packages and more!